If at first you don't succeed, try again. I had a post written, pictures posted, published pressed and off into the ether it blew, like leaves in last week's gales. So I went off and made myself a lovely spring lunch with freshly squeezed orange juice and I'll try again. I had to go into the city for a hearing test last Friday. My hip was incredibly sore and I could hardly stand. Even though it was almost 9:00 am, the train was absolutely packed. I had to stand all the way and I could hardly hobble when I left the train. Fortunately, it has suddenly cleared as mysteriously as it descended three weeks ago. My hearing was not good, it's been made worse by the congestion in my sinuses, something I've lived with since childhood. It will improve and I'm hoping the warm weather helps, but the doctor has threatened Prednisone, a steroid. I hate the stuff, have had it before and would do almost anything to avoid taking it. After returning to the station from audiologist, I found a kiosk selling jonquils so in self pity, I bought these. They were only $5 and lasted quite a while. I'm experimenting with camera settings here. Decreasing the light allowed in causes the depth of field or background to show with greater clarity. Here I've done the opposite. I think the aperture setting on a bright morning was f4 and you can see that the glasses and little bird are blurry. Deliberately so. More camera experimenting here. I was fiddling with iPad and exploring on it and opened Photobooth. There are settings there for special effects. This one is called mirror image and there are others which take subject in a swirl or with parts of the subject poking out. Both those looked quite wrong with a portrait but I thought the mirror image was interesting. I took Lynne's advice about knitting a cowl instead of metre upon metre of scarf. So I ripped out the scarf I'd been doing for my son and started this cowl. The organic merino/baby alpaca is still being held double and this is over half the cowl done. I've done baby booties with a similar stitch but nothing larger. This is five rows garter stitch alternating with five rows purl. It pulls the fabric down to have the purl rows standing out. 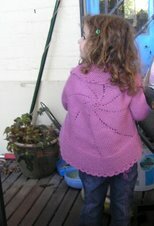 The yarn is beautifully soft and will be cosy around the neck. This is not a good photo. I'm holding the edge down to give more idea of the size and holding the camera in the other hand. Move those three stitches to left hand needle. This means yarn will be behind the furthermost stitch for i-cord. 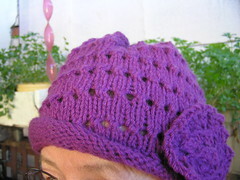 Knit front and back into the first stitch and then knit remaining two stitches. There should now be four stitches on righthand needle. Transfer three of these to the lefthand needle and repeat process, knitting front and back into the first stitch, and then knitting rest of stitches. When you transfer three stitches back to left needle, you will now have two stitches on right needle. It's slow if you want a large umber of stitches for garment, but it works as you can see from photo. It's not a tight edge but it's definitely more substantial and firmer than just a cast on edge. I've been working out how to do a similar cast off. I'm sure there's stuff on the net, but the actual cowl knitting is very easy and I'm thinking while I knit. I'd like to work it out myself as I did the cast on edge, even if I find it's another reinvent the wheel sort of thing. Older Grandson and I play with Photobooth from time to time but mostly he just likes to look at photos and videos of himself, his little brother and his parents! I'm glad you're feeling better with your hip - it sounds terrible! I'm sorry to hear your sinuses are still playing up. I had to take P. for a few weeks earlier this year and I won't be doing that again in a hurry! I love jonquils but can't cope with their perfume indoors. I find it almost offensive ... So the garden is full of them but I never cut them unless for someone else. Yes, jonquils are beautiful but they make me sneeze. I am glad your weird hip pain cleared up and sad that no-one offered you a seat. When I caught the bus I always gave my seat up to others when I was at school. Yuck, steroids I hope your sinus clears up with the warm weather. That's a very clever idea to do a cowl and even cleverer to invent a cast on- even if it was already invented. It looks great!! Are those snow clouds, mum?